Former KPCC president is a familiar face for Vatakara voters. There were many speculations among UDF partners and Congress workers about the outcome of Vatakara candidature. KPCC president Mullappally Ramachandran had announced that he would not contest in LS poll , this time because he wanted to concentrate on his new post as Kerala Pradesh Congress Committee president. The Central leadership of Congress party took Mullappally’s concern as a genuine request. However,the party workers in Vatakara were in desperate mode because they needed a ‘fighter’ and charismatic leader to outperform the dominance of P.Jayarajan. Their demand is met by the central and state leadership,finally. 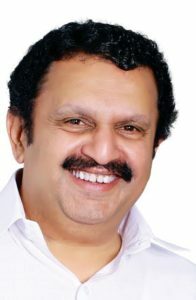 K.Muraleedhara is a crowd-puller in Congress party.His speeches and statements attract media attention every-time. The pol itical blood in late K.Karunakaran’s son has been always confident to beat political opponents and meet any tricks and traps in politics. Muraleedharan showed excellent performance during his tenure as the chief of KPCC. Political pundits opined that his leadership energised Congress party in grass root level. This News was posted on Tuesday, March 19th, 2019 at 2:23 pm and is filed under City Talk.